My First Bike explores the origins of professional frame builders by going back to the start and looking at the first bike they built. Today’s My First Bike features Nate Zukas of Augusta, Georgia’s Zukas Cycles. I built my first frame March 2011 in my workshop at home. I used a kit from Nova Cycle Supply that had lugs, BB shell and Dedacciai tubing. I pretty much copied the geometry from the Giant Bowery frame I was riding except I lowered the BB height about 3cm and shortening the top tube 2cm. I bought a pre-built steel fork but added a disc brake tab and internally routed the brake cable through the fork leg. I still use the bike on group rides, century rides and for exploring new dirt roads. I still get a warm feeling when I swing a leg over it knowing this was my first one! 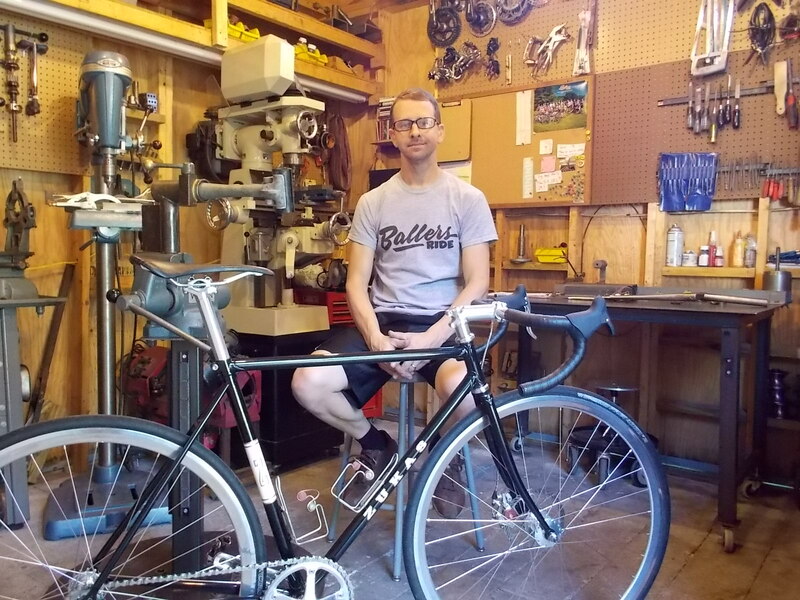 Why did you choose to build a fixed gear for your first one? 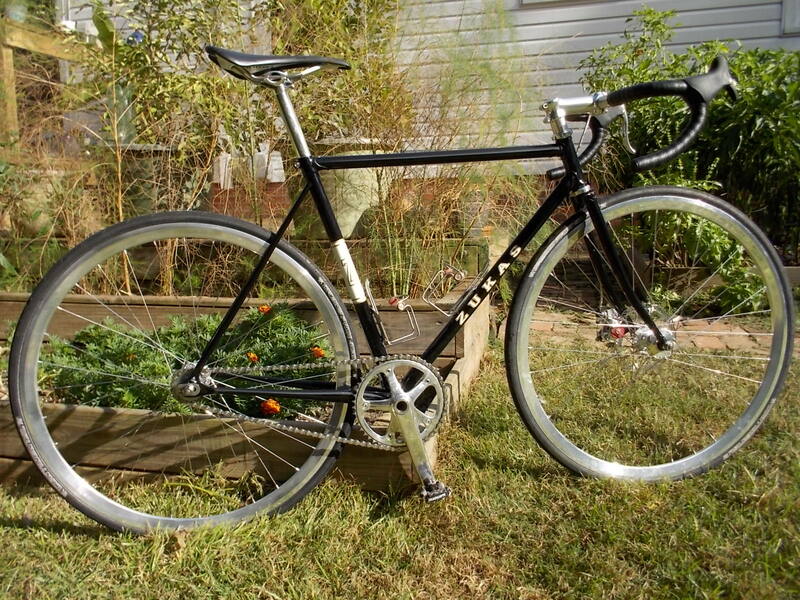 At the time I was riding a fixed gear a lot and found it to be a useful training tool. Since it was the style of bike I was putting in the miles on, I figured that would be the best was to test my work. Being a single speed also made it easy to build with no derailleurs or cable routing to deal with or a rear brake! What attracted you to frame building and how did you learn the craft? Fortunately working with my hands and learning a new craft is easy for me. For years I did a lot of custom paintwork on my bikes and other people’s frames. Also I was into turning old Hondas into café racers. Between the two I learned a lot about working with metal, finishing, and fabrication. A friend of mine suggested I should use these skills and build my own frame. So after many nights of reading builders’ sites and blogs and studying their flickr accounts, I started practicing brazing joints. At first I thought, “I don’t know about this!” But once I learned about proper torch settings and heat control, I was flowing brass and silver through my practice joints with ease and not burning off the flux! After acquiring a frame jig, I felt I was ready and turned out my first frame. I learned a lot during the whole process but I think my in-depth studying and practice made it a great experience. I have to thank the many other builders out there who take the time to show their craft with pictures. This is one of the reasons I take and post many pictures of my process and hope that someone may learn from it as well. Did you go into it planning to make frame building a career, or did that come later? After I built my first frame, one of my riding buddies immediately asked me to build him one. I told him I would after I built my cross frame. The cross frame was completed in time for the GA Cyclocross Series. At the first race, a shop owner flagged me down and asked who the builder was. After revealing that I was the builder and explaining the seat mast, internal cable routing, and tubing choices, he asked for my contact information. About a week later he gave me an order to build him and a buddy of his road frames just like my cross frame. Now with three orders in queue it was time to make this real with insurance, etc. My queue tends to be 3-4 frames, which is a nice balance with my full-time work. If business were really to take off, making Zukas Cycles full-time would be a dream come true! What career would you want to have if you weren’t working as a frame builder? That’s easy, my current gig as a bike mechanic! I have been wrenching professionally full time since 1991 at the same shop, Andy Jordan’s Bicycle Warehouse. I have established myself as the go-to guy in this area when other shops say it can’t be fixed or they can’t figure it out. For frame building, being a bike mechanic keeps me in tune with the latest parts, geometry, trends, and in general I have a hands-on to what works and does not in an industry with rapidly changing technology.